Tuesday – Ran three miles. Then did Max Out Power. Wednesday – Day 52 of Insanity Max:30 – Max Out Sweat. Thursday – Ran 8.5 miles. Also, did Max Out Strength. Friday – Last day of Insanity Max:30 – Friday Fight Round 2! Friday Fight Round 2 is definitely the hardest workout in the program. I maxed out at 6:33, just a 6 sec improvement. This program really pushed me and I will definitely continue to do more workouts from it even though I’ve finished the two month program. Saturday – Ran the Mommathon 5k, a local race put on my Mom’s Run This Town group and Uberthons. PR’d…woohoo! Race recap coming soon. Sunday – 11 mile run. I wasn’t able to run it as fast as the MyAsics app said after it recalculated paces, but it was still fast for me. 😛 They are just guideline paces. How did your week go? Happy first week of March! Happy Friday! I am linking up once again with Eat Pray Run DC, You Signed Up for What?! and Mar on the Run for their Friday Five Linkup. Every Friday they have a linkup for bloggers to link up a post about five things on their theme or you can write five things about your own topic. This weeks theme is “Free Friday” so we can write about anything. I’ve chosen to write about five things that have been on my mind this week. 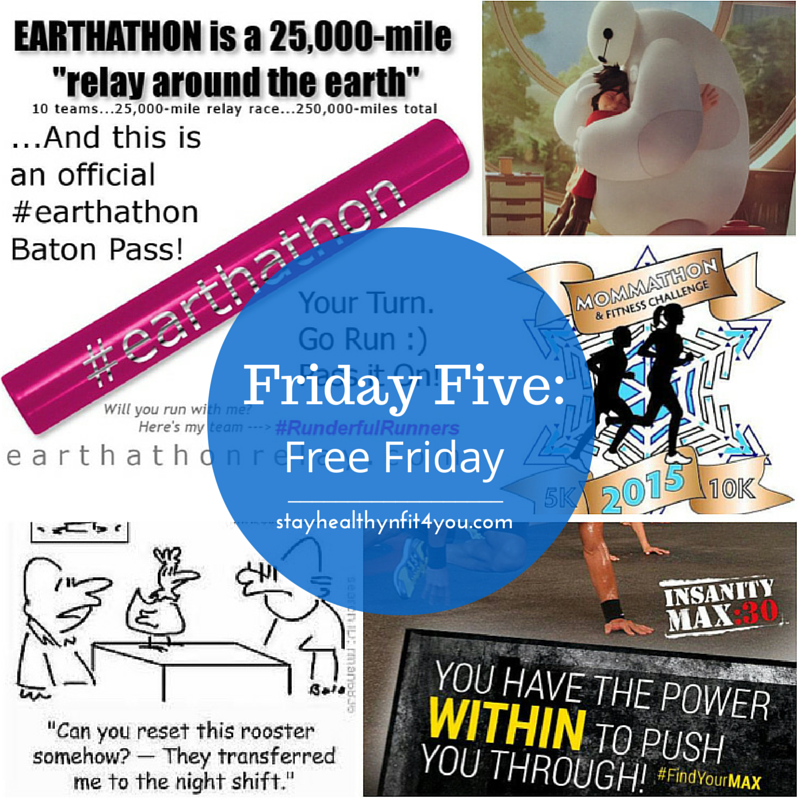 Earthathon was created by @GoRunHappy last year as a way to motivate others to exercise regularly. It’s picked up and for 2015, he set up ten teams to run a relay around the earth. The teams will combine and complete a total of 250,000 miles, which is the approximate distance to the moon. There will be ten teams but they are just a part of the bigger picture of “One Team, One Planet.” Once a team finishes their leg of the relay, they will help the other teams. When all teams have finished, they will have accomplished finishing a 250,000 mile relay. How cool is that? All you need is a Twitter account. 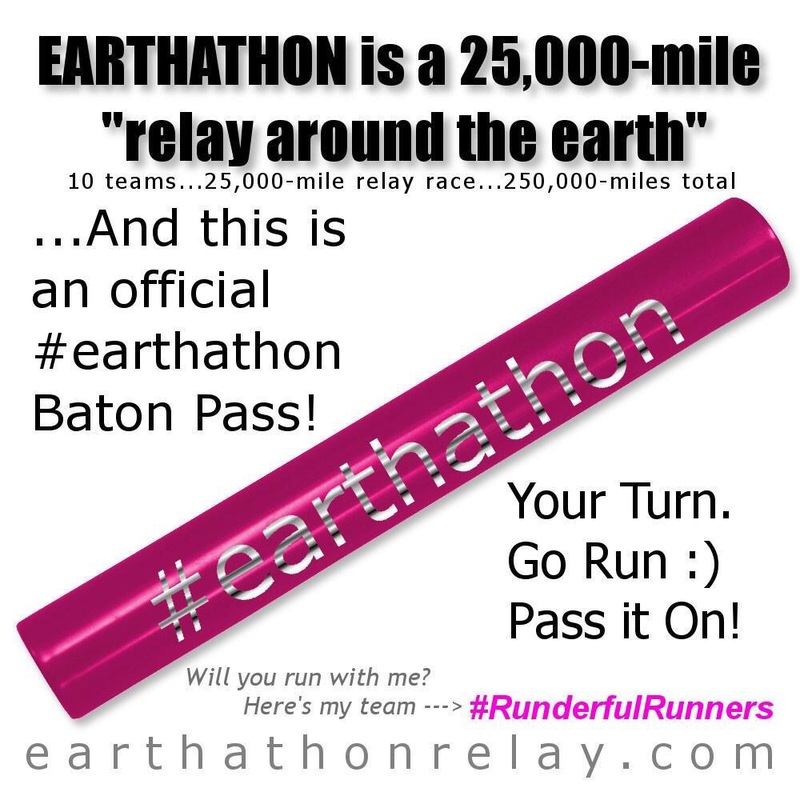 Learn more here http://earthathonrelay.com/. 2. Today’s the last workout (Friday Fight: Round 2) of the two month long program, Insanity Max:30. I can’t believe it’s the last day. It’s been tough and challenging but I’ve seen great improvement in my times. 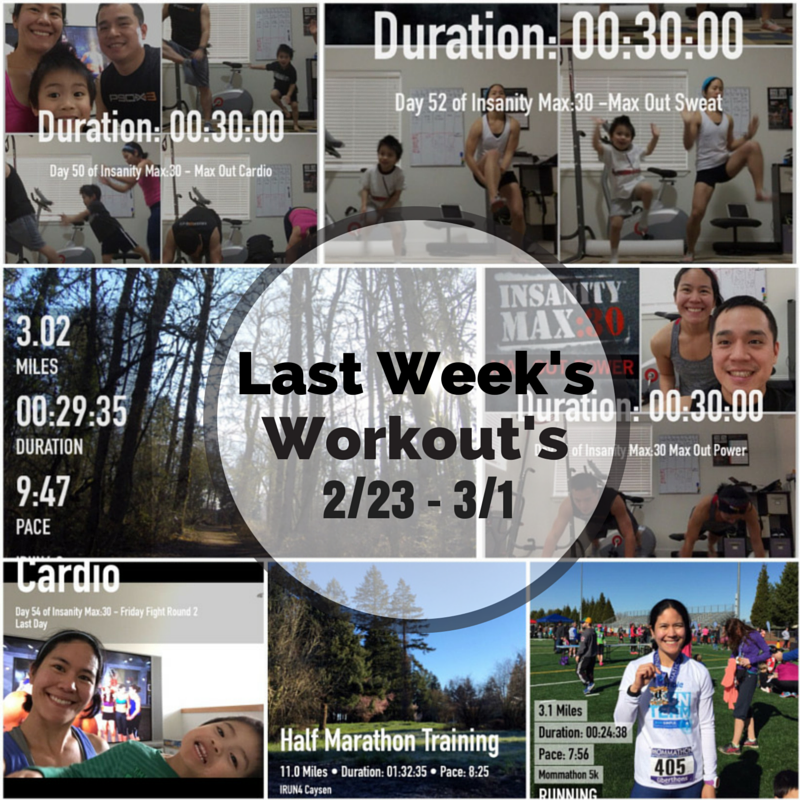 I like the concept of maxing out (the time when you have to take a break for the first time) and you’re pushing to beat your own time each week. It’s a great way to see how far you’ve gone. I feel more stronger and feel it’s helped with my endurance. I like this insane program and will continue to do workouts from it. 3. Saturday will be my first race of the year. I’m excited! 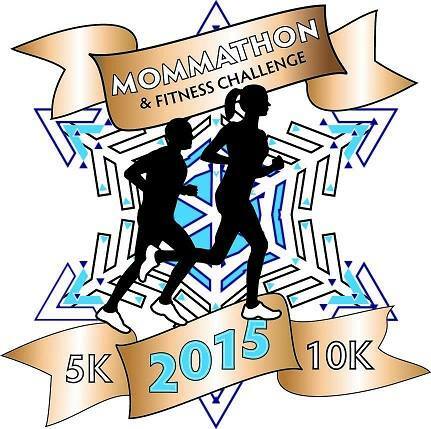 I’ll be doing the Mommathon 5k race that’s being put on by my local Mom’s Run This Town group and Uberthons. I blogged about this race previously and it should be a fun one. 4. We bought Big Hero 6 from Target and this is a pic from the back of the case. It’s so cute! The kiddos and I loved the movie! 5. Some really big news, I recently got a job offer and will be starting work again in April. This will be a big change since I haven’t worked since my eldest son was born, six years ago. I’ll be going back to the tech company I had w0rked for previously and will be working a compressed work week schedule. It will be 12 hour shifts and I’d work three days a week every other week and four days the other weeks. The thing I’m not looking forward to is that it will be on night shift. I felt it was time to go back to work but we’ll see how the night shift goes. I used to work nights so I’m familiar with it. I still plan to do all my scheduled races and pace for Uberthons. 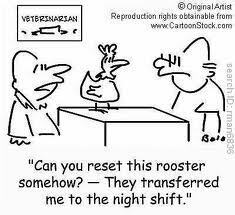 Have you ever worked a night shift? Any big weekend plans? Be sure to check out the other blogs in the linkup! Hope you have a great weekend! Monday: Running rest day. I did day 43 of Insanity Max:30 – Max Out Cardio. I maxed out at 9:38, a minute and four seconds improvement! Got day 44 of Insanity Max:30 – Max Out Power done earlier. Maxed out at 10:09, a 20 sec improvement 😃. Here are some clips from today's workout. Then got Max Out Sweat done. Got day 45 of Insanity Max:30 – Max Out Sweat done earlier today. It was tough after my run. I maxed out at 7:41, not an improvement. I'll try again next week. Thursday: Got day 46 of Insanity Max:30 – Max Out Strength done. Got day 46 of Insanity Max:30 – Max Out Strength completed. Maxed out at 8:02, an eleven second improvement 😃. Here are some clips from today's workout. Friday: Ran 3 miles on the treadmill and then did Max:30 Friday Fright Round 2. The side to side floor hops are still a killer. I maxed out at 6:27, a 5 sec improvement. Sunday: Ran 11 miles. Felt great! How’d your week go? Here’s to a great last week of February! Monday – Day 36 of Insanity Max:30 – Max Out Cardio completed. Maxed out at 8:34, a 27 sec improvement. 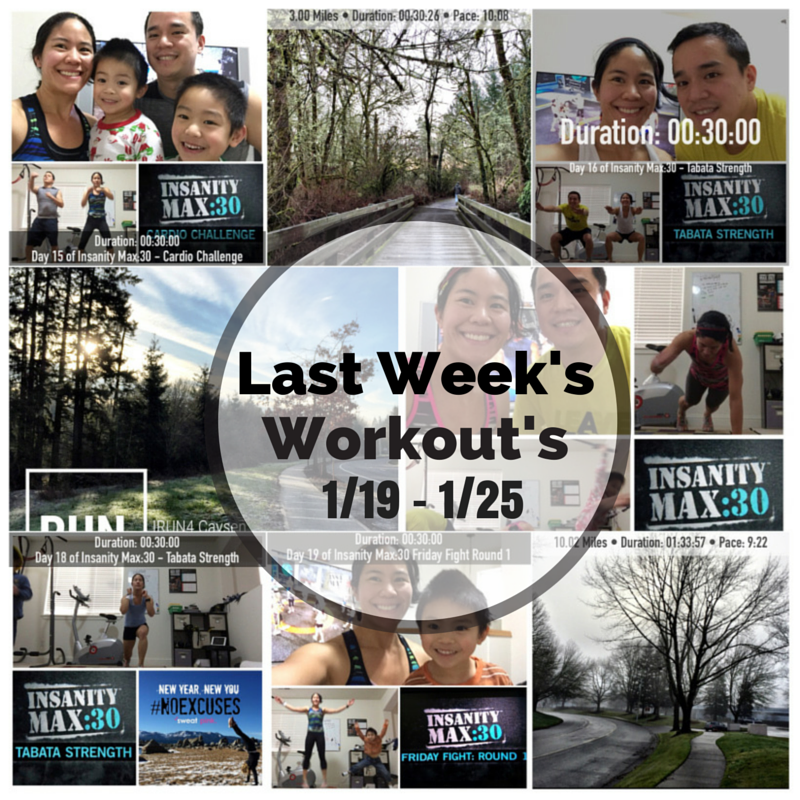 Here are some clips from today's Insanity Max:30 workout – Max Out Cardio. Who else wants to join me in this fun and challenging program? There's also a modifier for every move. Tuesday – Ran three miles easy and had to make a detour because of the high water on the trail by the bridge. Then did Max:30 – Max Out Power. Maxed out at 9:49, an improvement from last time. Wednesday – Day 38 of Insanity Max:30 – Max Out Sweat done! I improved my max out time by 42 sec . Time was 8:22. Thursday – Ran 7.5 miles while the lil guy was in preschool. Then later in the afternoon did Insanity Max:30 – Max Out Strength. Maxed out at 7:51, a few seconds improvement. Friday – Ran three miles on the treadmill and then did Day 40 of Insanity Max:30 – Friday Fight Round 2. This one’s tough. After the iron legs move, the side to side floor hops kill. Maxed out at 6:22. Improved by 4 sec. Sunday – Had a nice 8 mile run. What was the best part of your week? Here’s to another great week of workouts! Monday – I did Insanity Max:30 – Max Out Cardio. Maxed out at 8:07. Had a great sweat session! Also, I got a yoga pose, the Warrior for Monday’s #SweatPink #NoExcuseschallenge. Tuesday – Started with a nice 3 mile run to a local park! Then did Day 30 of Insanity Max:30 – Max Out Power. Wow, what a workout! Maxed out at 8:51. I also got my push-ups in for the #SweatPink #NoExcuses challenge during the workout. 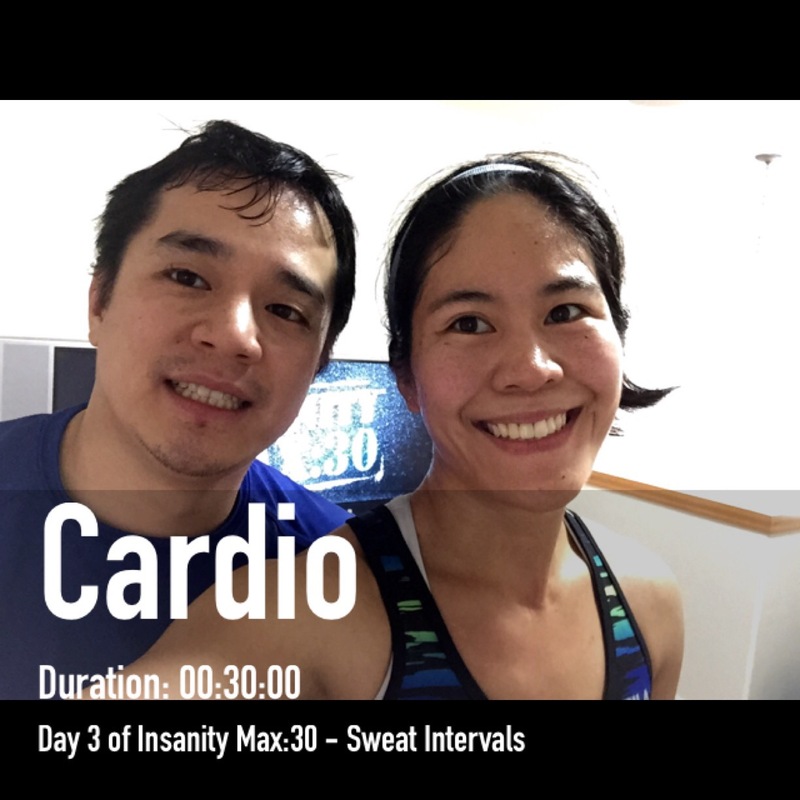 Day 30 of Insanity Max:30 – Max Out Power completed! Wow, what a workout! Maxed out at 8:51. I got my push-ups in for the #SweatPink #NoExcuses challenge during the workout. 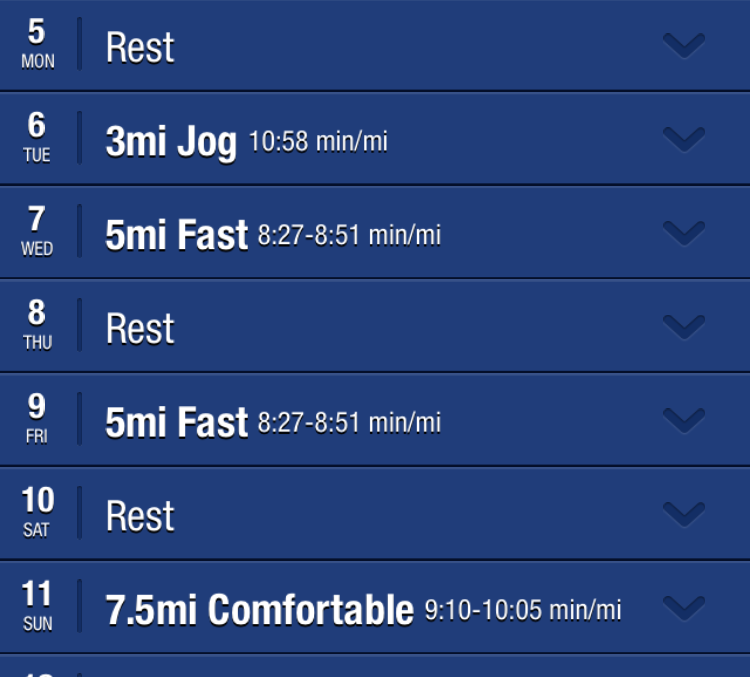 Wednesday – I had a good 7.5 mile build up run. Then did Day 31 of Insanity Max:30 – Max Out Sweat. Day 31 of Insanity Max:30 – Max Out Sweat completed after my run. This one sure makes you sweat! Maxed out at 7:40. It's fun watching my lil guy go! I also got my high knees in with added switch kicks for the day’s #sweatpink #NoExcuses challenge. I got my high knees in with added switch kicks for today's #sweatpink #NoExcuses challenge. Thursday – Day 32 of Insanity Max:30 – Max Out Strength. Maxed out at 7:47. Day 32 of Insanity Max:30 – Max Out Strength done. Another tough one! Total body workout and especially my shoulders and arms are toast. Maxed out at 7:47. I also got my plank in for the #SweatPink #NoExcuses challenge. Friday – I ran three miles on the treadmill and then I did day 33 of Insanity Max:30 Friday Fight Round 2. Maxed out at 6:18. I did day 33 of Insanity Max:30 Friday Fight Round 2 after my TM run for the first time. OMG this one's crazy hard! Maxed out at 6:18. After the iron legs move and then the hop things, my legs were burning! Sunday – Had a good 8 mile run. How’d your week go? Here’s to a great week ahead! 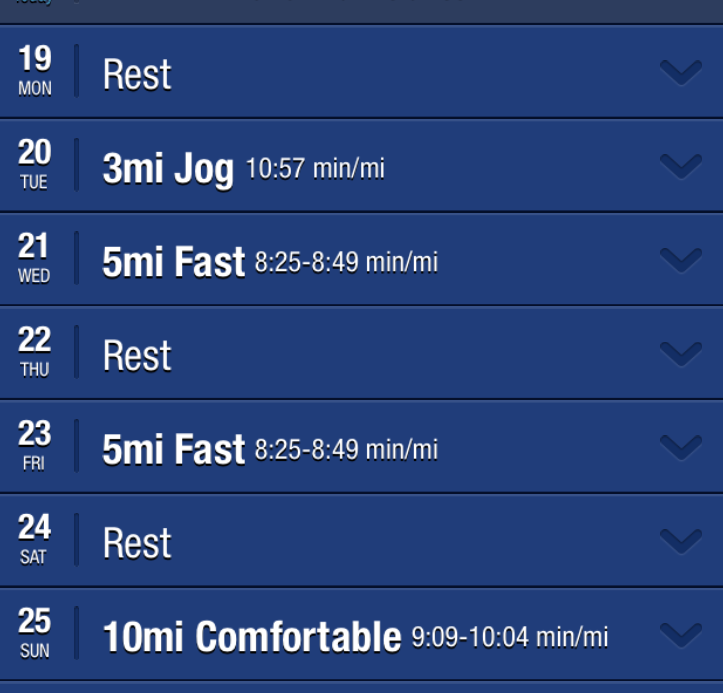 I moved many of the runs to fit my schedule but I got around the same mileage in. Monday – Day 22 of Insanity Max:30 – Cardio Challenge completed. I maxed out at 12:36, a 3 min 27 sec improvement! Tuesday – I decided to run the Mom’s Run This Town Virtual 10k. It was a good fast one! I also did Max:30 Tabata Strength. I maxed out at 10:41, a 32 sec improvement! I still don’t like this one because of all the diamond and v push-ups. I just need to keep working on them. Wednesday – I did Max:30 – Sweat Intervals. I improved my max out time and got 11:31. Here’s some video clips when my little guy decided to join me at the end. You may have seen it in my previous post, but I think it’s cute :). 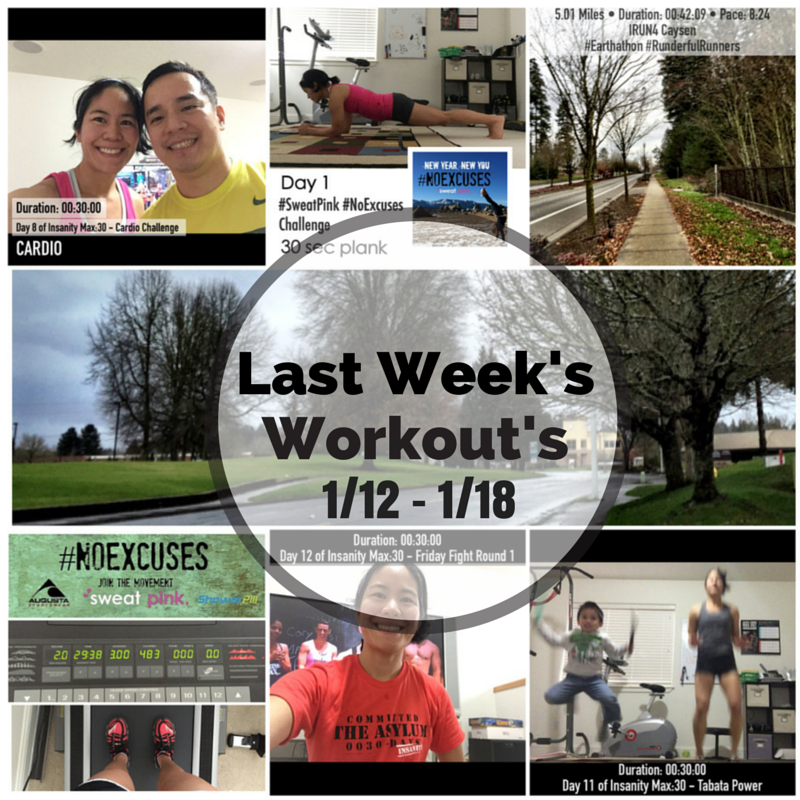 Thursday – I ran 5 miles on the treadmill! That was tough! I’m not used to running that much on it. It was my longest run ever. Watching on the iPad helps! Then I did day 25 of Insanity Max:30 – Tabata Strength. I maxed out at 10:45 which was a few sec improvement. Friday – I ran 3 miles on the treadmill. I also did day 26 Max:30 – Friday Fight Round 1. I maxed out at 8:46, a 7 sec improvement. Sunday – I ran a nice 10 miles. How’d your week go? Happy first week of February! Happy Friday!! I am linking up with Eat Pray Run DC, You Signed Up for What?! and Mar on the Run for the Friday Five Linkup. Every Friday they have a linkup for bloggers to link up a post about five things or write on their own theme. 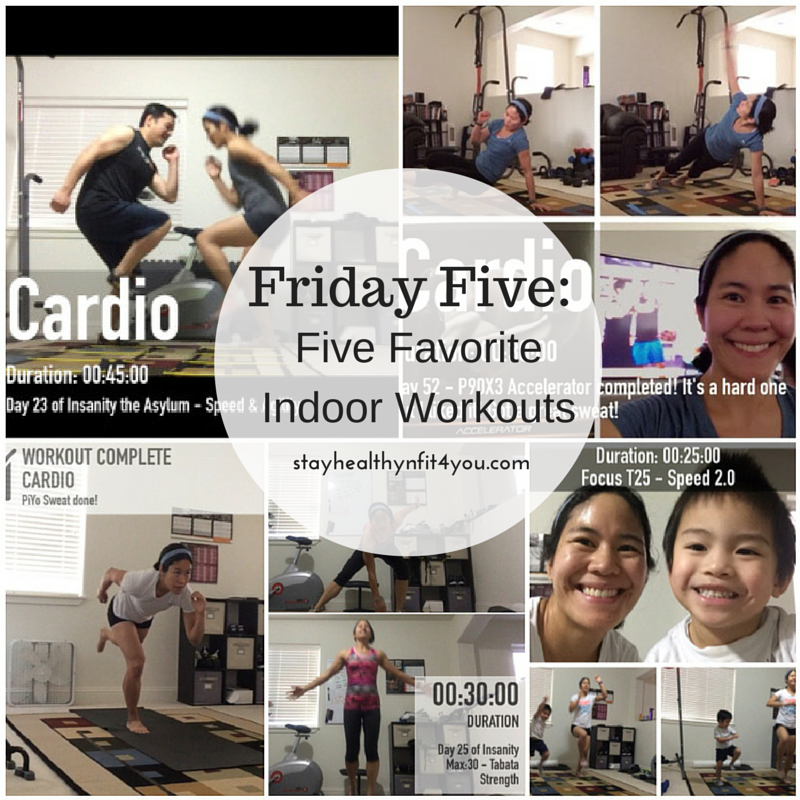 This week’s theme is “Favorite Indoor Workouts”. I have to say I’ve had a lot of experience working out indoors especially at home. I like the convenience of working out at home. You don’t have to drive anywhere, don’t have to wait to use equipment, or wait for a class. Working out at home is especially convenient for me because I have two kiddos. I can’t just go out for a run since there’s no one to watch them, but I can get in my workout indoors. 1. Insanity Max:30. I’m currently doing this workout program and it’s insane but gives such a great workout. I love how they’ve incorporated Tabata style workouts into the program, which is when you do a move for 20 seconds and then rest/jog in place for 10 seconds. Here’s a video with some moves from Tabata Strength. 3. Focus T25. Here’s another Shaun T program. I like how these workouts were only 25 minutes long. This is the program that got me more into Beachbody. I had done the original Insanity a while back but I loved how this one was much shorter in length. I love the Speed workouts. These ones are fast paced and always had me dripping sweat at the end. Here’s videos of Speed 2.0 and Speed 3.0. 4. P90X3. This was my first time doing a P90X program. I had heard about P90X but saw how long the workouts were and that put me off. But when I heard there was a 30 minute P90, I thought I’d try it out and I’d say it’s a great program. It was 90 days and I liked the variety of workouts. I could not do pull ups for the life of me or do the crow pose. By the end I was doing real unassisted pull-ups and nailed the crow pose. Here’s a video of some of the moves from P90X3 Accelerator. This ones a great total body workout with lots of leg and plank work. 5. Insanity the Asylum. This is a tough program but I liked how this was only a month long. I liked how it incorporated the Agility ladder. I think my favorite workout from this program was Speed & Agility. Here’s some moves from that workout. As you can see, I’m showing my love for Beachbody programs. These workouts have really kept me in shape. What are your favorite indoor workouts or programs? 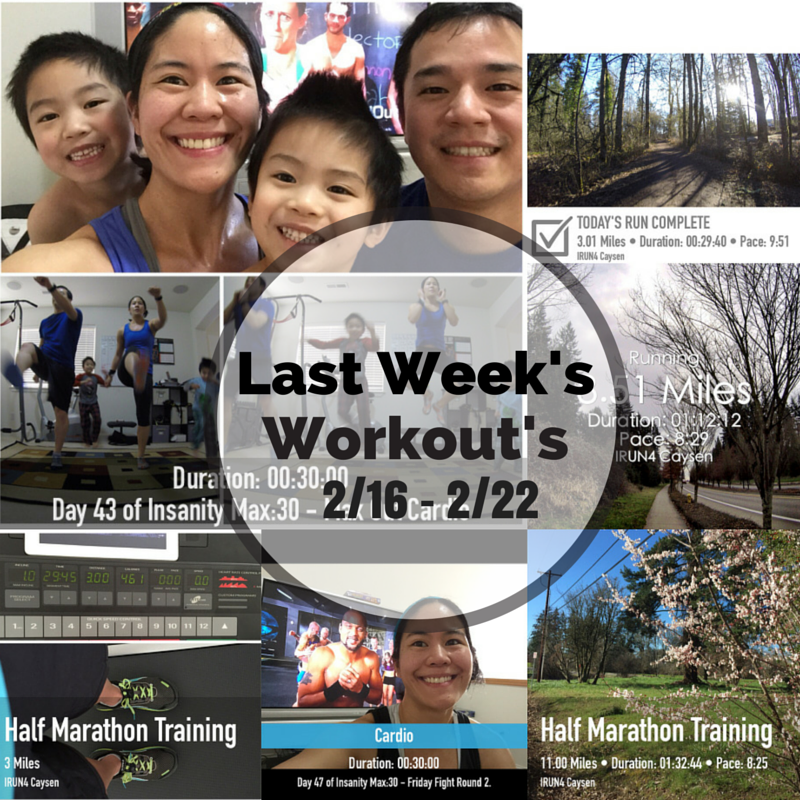 Monday – Day 15 of Insanity Max 30 – Cardio Challenge. I improved my max out time and got 9:09 . Took a family selfie afterwards lol. Tuesday – Ran 3 miles and then did Day 16 of Insanity Max:30 – Tabata Strength. First time doing this workout and maxed out at 10:09. . I also got my push-ups done for the #SweatPink #NoExcusesChallenge. 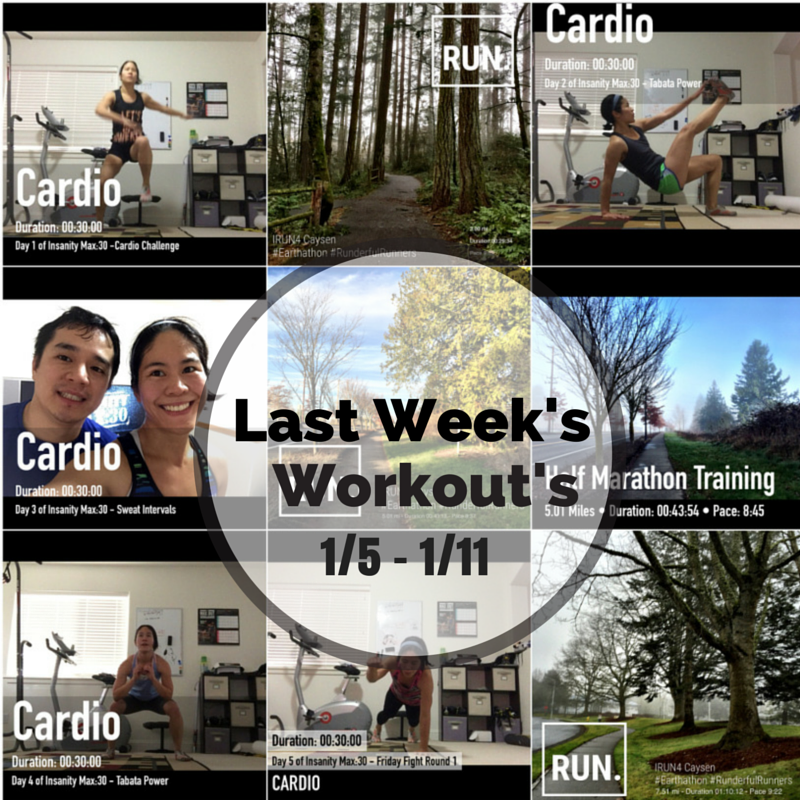 Wednesday – Ran five miles and then did Insanity Max:30 – Sweat Intervals. Had a great workout and improved my max out time! Got 9:56. 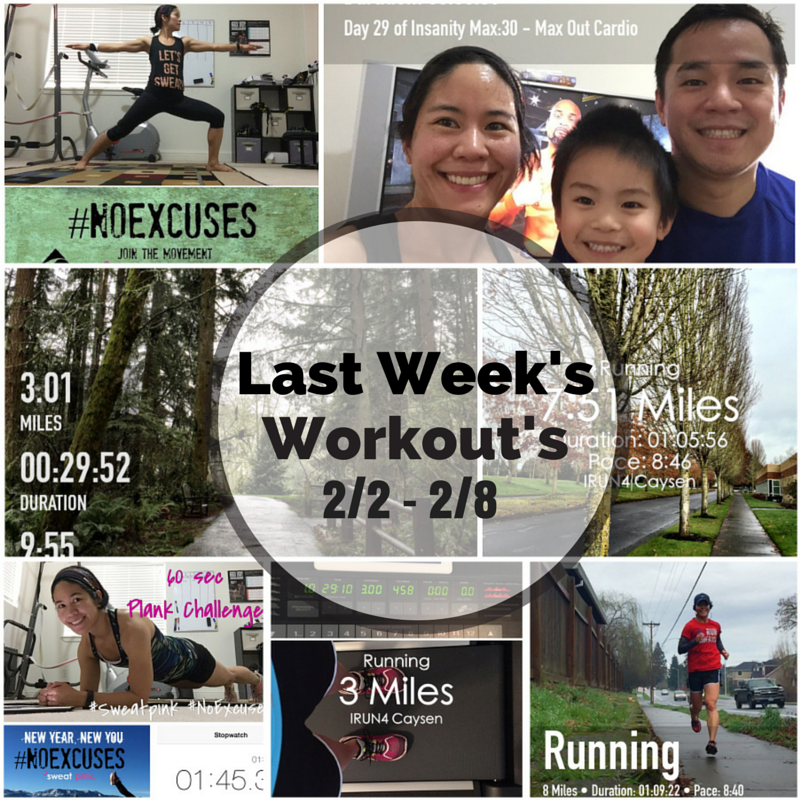 Thursday – I switched Friday’s run workout and did it Thursday since my kiddo has Preschool and wouldn’t be able to run outside on Friday. I also did Insanity Max:30 Tabata Strength. Sunday – Ran a good 10 miles. How’d your week go? Here’s to a great week ahead! Before I get into the workouts recap, I found out on Friday that my application to become a FitFluential Ambassador was approved….woohoo! I’m pretty excited and happy to be a part of this group. It’s another outlet in which I hope to inspire others to be active and healthy. 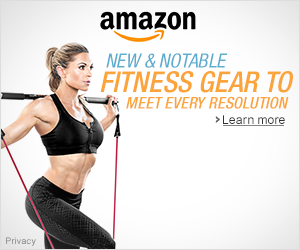 I’m looking forward to connecting with health and fitness brands. I switched Wednesday and Thursday around since I’m able to run outside on Thursday’s when the lil guy is in Preschool. 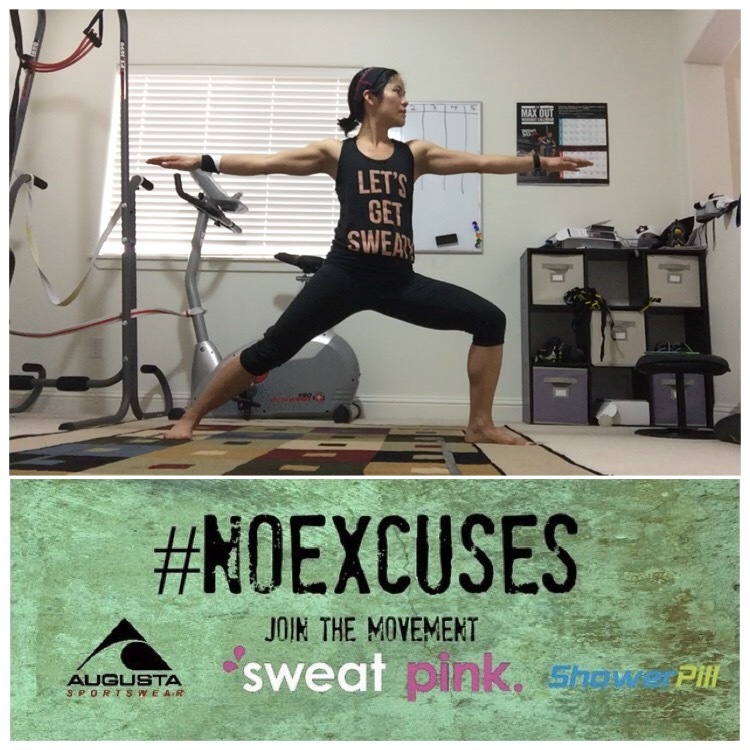 I also participated in the #SweatPink #NoExcuses challenge. Monday – I did day 8 of Insanity Max:30 – Cardio Challenge with the hubby. Maxed out at 8:53 which was a little improvement from last time. I also did Day 1 of the #SweatPink #NoExcuses Challenge, 30 sec plank. Wednesday – Got day 10 of Insanity Max:30 – Sweat Intervals done. I was happy I improved my max out time again which was 9:17. Day 3 of the #SweatPink #NoExcuses Challenge was 10 burpees (any variation). I did burpee lunges from Insanity Max:30 – Sweat Intervals. Day 4 of the #SweatPink #NoExcuses challenge was 20 squats (any variation). I did squats with knee ups from the Tabata Power workout. Friday – I did day 12 of Insanity Max:30 -Friday Fight Round 1. I maxed out at 8:22, a 10 second improvement. I decided to wear my free shirt that I just got from completing Insanity the Asylum: Volume 1. 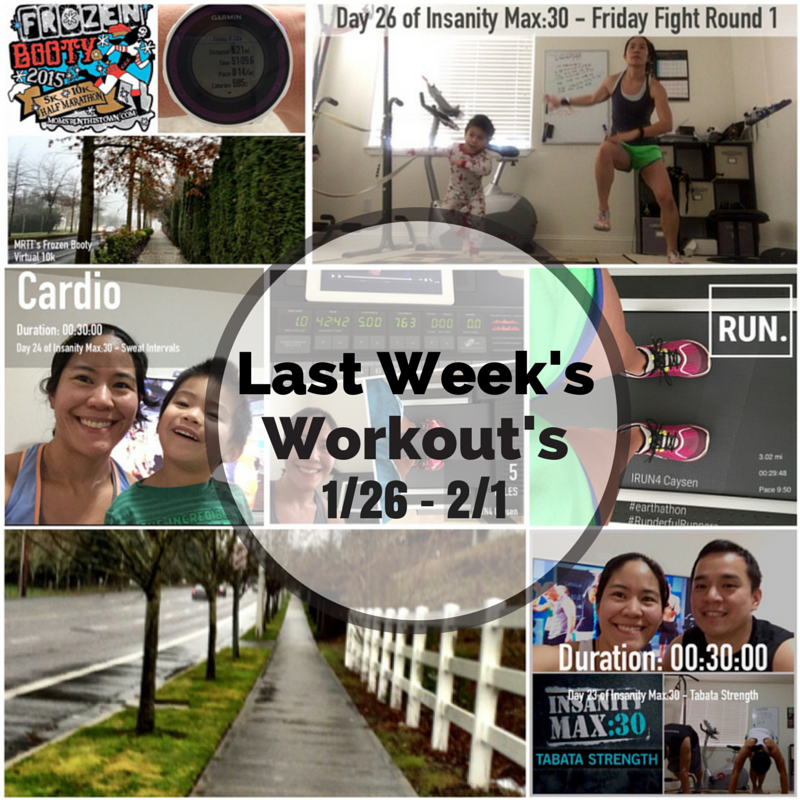 I also ran three miles on the treadmill and that was my #FreeFriday pick for Day 5 of the #SweatPink #NoExcuses challenge. Monday – Day 1 of Insanity Max:30 – Cardio Challenge. Max out time was 7:49. Tuesday – I ran 3 miles and then did Day 2 of Insanity Max:30 – Tabata Power. Max out time was 9:44. 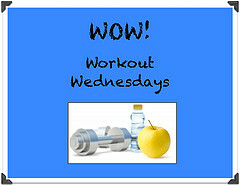 Wednesday – I did day 3 of Insanity Max:30 – Sweat Intervals with my hubby. Maxed out at 8:23. Then in the afternoon, I ran five miles. Thursday – I switched run days and ran five miles instead of on Friday since my little guy has Preschool. Then later did Insanity Max:30 – Tabata Power. Maxed out at 9:43. I did not improve on this time and was one second ahead of last time. Those side to side plyo push-ups are tough. Friday – Day 5 of Insanity Max:30 – Friday Fight Round 1. I maxed out at 8:12.